After the completion of “Armageddon March Eternal” K didn’t write a single note for quite some time. We felt so satisfied with what we had achieved with said album and had no idea as for how to continue, really. 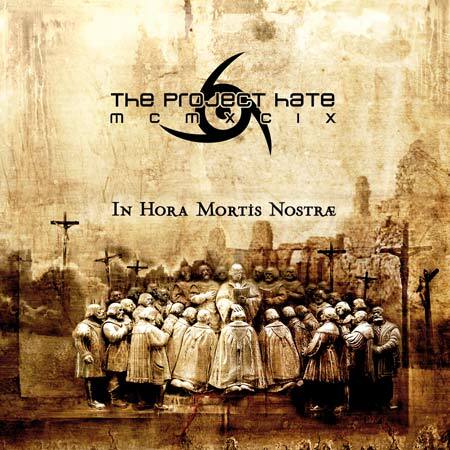 We just took it easy and then one day 7 tracks of mighty TPH material had arrived and “In Hora Mortis Nostræ” was being recorded. To be perfectly serious, we are not quite sure how the hell it happened. Following the same recording process as on “AME”, which meant no deadlines whatsoever, we started tracking the guitars in October 2006 and worked with those until January 2007. For the first time in our career we utilized a real drummer together with the usual programmings. Daniel Moilanen, then with the band Engel, did his stuff over 2 days in Gothenburg in February 2007. Jonna and Jörgen did their vocals in Örebro during March 2007 and Michael nailed his bass in Gothenburg, March/April 2007. Everything was perfected and mixed by K and Dan Swanö in his Unisound Studios during April/May, 2007. Jonna came up with the title and K had no second thoughts about it. As always, Marko Saarelainen drew inspiration from the title and created new magic. There are a lot of details in this one that you really have to look closely for to notice. The stream of blood you can see in the picture was K’s idea since he thought the image lacked something originally.